From the book “One hundred and ninety one coats” by historian Aurora Delmonaco. In March 2011, Historian Aurora Delmonaco published a book called “Centonovantuno cappotti. Inediti garibaldini dalla Terra di Laroro” (“One hundred and ninety one coats. Unpublished documents on Garibaldi’s expedition from Terra di Lavoro [a geographical area in Southern Italy]”) In the book, Historian Delmonaco tells about the participation of 191 Southern volunteers, assembled in the Matese Legion, in the battle of Volturno, on October 1st 1860. Volturno was the last and culminating battle of Garibaldi’s troops to free the Kingdom of Naples from their Bourbon King and unite it to Northern Italy in one unified country. One of the Legion volunteers, Captain Iannotta, wrote a journal on the battle in which he participated. Most of Delmonaco’s recount of the battle is taken from the Journal. From it we learn that during the battle of Volturno, the Matese Legion was commanded by a Florentine officer, Major Guadagno Guadagni, our great-grandfather. 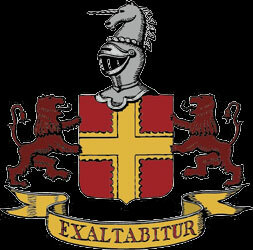 As soon as she found that out, Historian Delmonaco, who knew about us through the “Guadagni Family Website”, contacted me to know if I would be interested in learning more about Guadagno’s role in the battle of Volturno. I answered her that I, and the whole Guadagni Family, would love to hear about it. So Delmonaco, very gently, sent me an email with the attachment of her book. Great-grandfather appears in Iannotta’s journal, early on October the 1st morning. He leaves in the early afternoon. I will recount his actions in the battle, following Iannotta’s journal, where the Captain speaks in first person, and adding necessary explanations where needed. 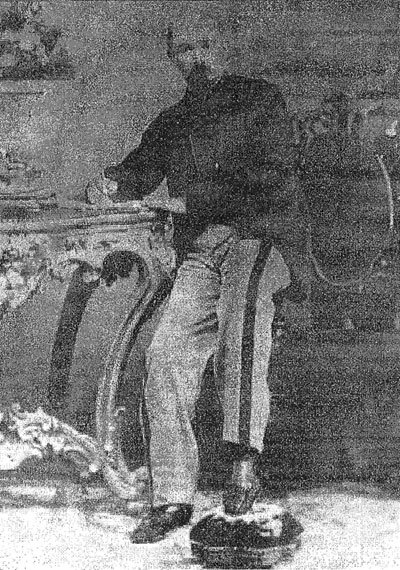 Captain Iannotta was the author of a journal on the battle of Volturno, from which the information on most of Major Guadagni's role in it was taken. On the morning of October 1st 1860, we got up very early. The battle had already started. We lined up in the center of the market square. Our leader, Major de Blasiis, had left for Naples the day before. He had not come back. Captain Campagnano and I were at the head of our companies, waiting for orders to participate in the battle. I was ready to go anywhere there was fighting, to do our duty. Campagnano instead was telling me it was better to wait for orders from above, because we did not know the plan of the chief of staff. If we started on our own, we ran the risk of going somewhere where we were not needed and our effort would be useless. We waited some more. Finally around 7:30 AM, we saw a mounted officer appear on the street of the theatre. He was galloping full speed. As soon as he got in front of us, he stopped abruptly. Both him and his horse, were in a sweat. It was Major Guadagni [Guadagno Guadagni] from Florence, pale, tired from the long galloping…He had galloped all the way from Santa Maria, sent by Garibaldi himself. Captain Campagnano and I moved towards him, but he was unable to speak. He relaxed a little. He seemed absent-minded and lost in deep thoughts. He asked us: “Which army corps are you?” We answered: “Matese Legion”. “Who is your commanding officer?”“He is gone. Right now we are in charge.” “Well, he went on, the Dictator (name given to Garibaldi, because he was in charge of the whole campaign), ordered me to take command of any military corps I find to accomplish an important mission; will you allow me to be the commander of your Legion for today?” “Yes sir!! !” we answered. “Then, follow me!” he said. Exhausted as he was, Major Guadagni took out his pistol: ”Show me, he said, where is the house of that dog of a priest!...” And he started walking quickly behind the soldiers. They passed by me. I asked them what was the problem and they told me. “Major, I asked, do you want me to come with you?” “Thank you Captain, answered Guadagni, I want to go by myself”. I called ten of my soldiers anyway and we followed him to the entrance of the house. The Major went upstairs, found the priest, pointed his gun to his chest and told him what he deserved to hear. The priest was scared and threw himself at the Major’s feet, asking for mercy…At that point the Major left him. When he came downstairs, I asked him what he had told the priest. “He was really depressed that dirty rat…!” answered Guadagni. 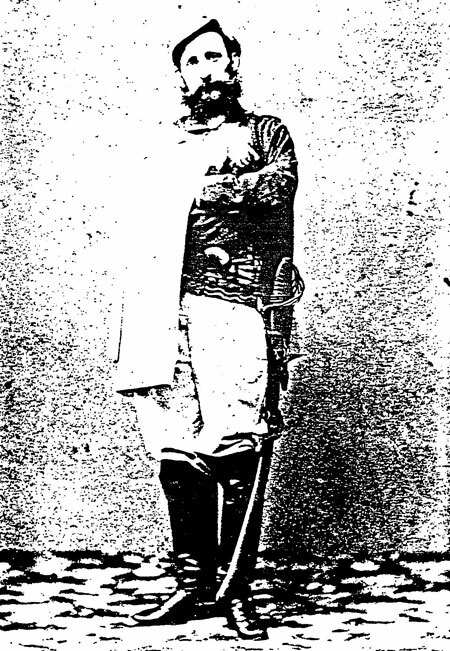 Major Guadagno Guadagni (1833-1905) in his uniform as officer of the Garibaldi Army. We joined the rest of the Legion and started marching again, up the mountain. We arrived at a small flat ridge. The Major ordered us to stop…From that high point we could hear continuous gunfire coming from all sides. From the side of the town of Capua we could see white smoke slowly dispersing in the air from several shooting cannons. 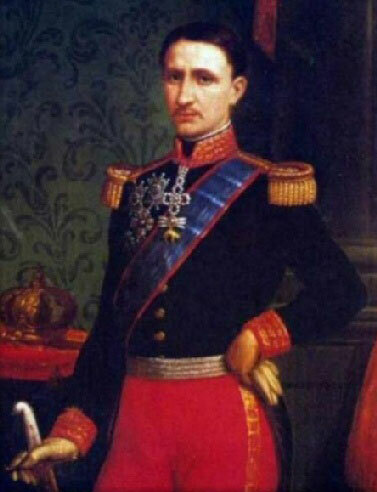 Bourbon King Francesco II on Naples, against whom major Guadagni was fighting. We resumed our march and we got to the top of the mountain. We looked all over the place but could not find any trace of the enemy force. We started going towards North-East; we walked for about a mile and a half in farmland, through hilltops, cliffs and little valleys. As soon as the peasants who were working the land saw our Legion, they ran away from us. We passed by a little village, I think it was called Casola. We asked if anybody had seen the enemy, but nobody knew where they were hiding or wanted to tell us. We walked for another mile. Our small advance party was walking in front of us. A low hill, stretching northward, appeared on our way. On the side of the hill, half a mile from us, we saw a group of people dressed in white. We stopped and looked at them. Major Guadagni dismounted, took his telescope, leaned it against a wall in the shape of an old epitaph, and started observing them. “Look better, I added, they are not women..!” At that moment our vanguard gave the alarm! They warned us that the enemy column was behind the hill. At the same time the group of soldiers facing us was increasing fast. They lined up on the field and opened fire. We also spread out in half a circle and divided ourselves in three groups. About fifty of us remained in front of the enemy, lined up on a hill, and started firing back. Our other two sections, lined up on our left, started firing also. While the battle was beginning, the entire Bourbon column appeared on top of the hill. At this point we realized we were facing an impressive enemy force and they were all shooting. We were about fifteen or eighteen hundred feet apart. The enemy fire had a hard time reaching us, ours was more efficient. A part of us were hunters and carried hand-made cartridges, with very powerful English sliver in them, which we had secured before the expedition. The gunfire lasted about half-an-hour but both the enemy and we kept our positions. It was near to ten thirty in the morning. The Bourbon forces started moving. They extended their wings in a large circular form. Their right was advancing faster going towards South. Their movements made us think they wanted to encircle us. We stretched our wing trying to block them; however we were too few to stop them in the open field. So we started retreating towards the little village behind us while keeping an open fire at them all the time. The villagers realized the attack to their town was imminent and feared their women might be raped. So they hid them in a wood covered valley, which was going South-East from their town. While retreating with several of my men, we crossed that valley, and I noticed two pretty young women hiding in the bush. When they saw us, the poor women started crying, begging us, in the name of the Blessed Virgin Mary, not to touch them. I told them not to be afraid of us, we had no intention of hurting them, but rather to be careful of the Bourbon soldiers, who were coming close behind us… I told them to hide better, so the enemy could not see them; I had them lie down under a very thick brush, where it was hard to spot them. We went through the ravine and reunited with our other column, which was retreating from the other side of the village. We all assembled behind the church, located a little out of the Southern part of the town. The Bourbon soldiers gained courage at the sight of our retreat; they closed their ranks and advanced towards the village to attack us. A group of German Bavarian soldiers were marching well ahead of the rest. They had gotten not far from us; we rushed out from behind both sides of the church and fired on them full blast at close range. Those white coated swashbucklers ran away hastily in great disorder and rejoined the ranks of the rest of their army. At the sight of our counterattack, the enemy column stopped. For a few minutes we shot at each other; then, the Bourbons started their encircling maneuver again, stretching their wings around us to try and attack us on our flanks. We slowed them down by circling and twirling our forces in front of them. However our main goal was to move the enemy away from the area they were ordered to go to, by drawing them toward us and keeping them busy. So Major Guadagni ordered us to retreat again while keeping firing on them. Our first movement was in the direction of the town of Caserta Vecchia on our left. The enemy must have thought that we wanted to occupy the town. As they were closer to it than we were, they rushed toward it and occupied it with a big part of their army. We were happy about it, realizing that the enemy would never abandon Caserta Vecchia, for fear we would occupy it, and so now they had divided their forces in two. Major Guadagni was galloping back and forth along our lines, telling us where to go, in spite of a high fever and a hoarse voice, and our retreat was orderly and well executed. Instead, the half of the enemy army left fighting against us was advancing extremely slowly. At noon we returned on top of the mountain of Caserta. That would have been for us an excellent position, because we could have easily kept the enemy at bay from behind the rocks, and they would have been unable to encircle us. However we wanted to attract the Bourbons on top of the mountain, on the Southern side, so they would have been invisible to the rest of their army, in case they were needed to help defeat our troops at Maddaloni or Sant’Angelo, according to their battle plan. Therefore we started descending from the top of the mountain. When we got halfway, we assembled and aligned all around the mountain, along an old path, bordered by a low bank full of many oak trees and other vegetation. In the meantime the enemy arrived at the top of the mountain, but refused to come down after us. They fortified themselves behind the large rocks and started shooting at us. We shot back at them. However both of us were well covered so it was hard to do each other much harm. From where we were, we could hear the fighting going on all around us. The cannon were thundering toward Santa Maria, Sant’Angelo and Maddaloni, mixed to extended rifle discharges. From the neighborhood of Old Caserta, enemy cannon was shooting towards us from time to time, but the cannonballs were flying high over us and did us no harm. “Major Guadagni left and we saw him no more, either his fever had increased or maybe he thought the goal of his action was achieved”. These are the last words Captain Iannotta dedicates to Major Guadagni’s intervention in the battle of Volturno in his journal. It was around two o’ clock in the afternoon. And Major Guadagni was right: his goal was completely achieved. Of the huge enemy force that was supposed to attack Garibaldi’s troops from behind and crush them, half was stuck in the defense of Caserta Vecchia, which nobody was attacking, while the other half was well fortified on top of the mountain but of no use to anyone and their allies did not even know where they were and could not get a hold of them if they needed them. Furthermore, Guadagni had kept the promise he made to his men in the early hours of the morning: not one of them was killed in the all day long encounter with over thirty times as many enemy troops. He chose not to lead them in a “heroic” but bloody and useless charge against the overwhelming enemy, but instead to keep them at a safe distance from the Bourbons while calmly harassing and disturbing the enemy until he was able to draw them in places where they were useless and separated from the main battle. In the early afternoon, a high-ranking officer of Garibaldi, General Turr sent a message to General Bixio, another officer of Garibaldi, stating: “Be careful about the possibility of an enemy break through close to Caserta Vecchia. We have no troops there except an officer of my General Staff with a few poorly armed Calabrian volunteers.” However, the officer was Major Guadagni and his few volunteers were the Matese Legion and no enemy was able to go through there all day. 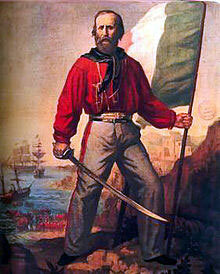 Giuseppe Garibaldi (1807-1882), organizer and leader of the expedition to free the Kingdom of Naples from the Bourbon King Francesco II and unite it to Northern Italy. 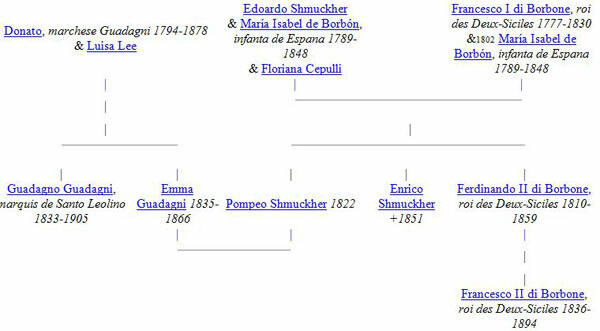 Guadagno Guadagni was King Francesco II of Bourbon's step-aunt (Emma Guadagni Shmuckher)'s older brother. I want to thank Historian Aurora Delmonaco for having contacted me, a Guadagni descendant, about the book she was writing on Major Guadagni’s participation in the battle of Volturno. All of us Guadagni owe her all this information and we are very grateful to her. By the way, it was Great-grandfather Guadagno who commissioned Passerini to write the book on the History of the Guadagni Family. Passerini finished his book in 1872, 12 years after Volturno, and it includes Guadagno’s life until that year. Obviously Guadagno chose not to tell him about his role in the battle of Volturno or in Italy’s 2nd War of Indipendence (1859) or in his participation in the Crimean War (1853-1856).